Cleveland Cavaliers forward LeBron James has inked a lifetime deal with Nike, ensuring that once his playing days are over, the apparel company will sell his image and brand forever. While insiders are sure that Michael Jordan has some kind of extended deal with Nike, according to ESPN, this is the first time the fitness-apparel company has acknowledged making a lifetime deal with an athlete. Specifics of the contract were not released, but a source familiar with the negotiations told ESPN that it is the "largest single-athlete guarantee in company history." "We can confirm that we have agreed to a lifetime relationship with LeBron that provides significant value to our business, brand and shareholders," read a statement released by Nike and viewed by ESPN. "We have already built a strong LeBron business over the past 12 years, and we see the potential for this to continue to grow throughout his playing career and beyond." 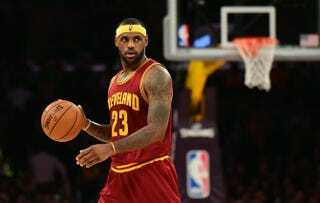 James told reporters at Cavaliers practice Monday that he is humbled by the deal. "I'm very humble, man. It's been an unbelievable time for myself and my family, and I'm just grateful that Nike and [Nike founder] Phil Knight and everyone over there just believed in a skinny-old, skinny, 18-year-old kid from Akron, Ohio, and I'm happy to be a part of such a great company," he said. Before the lifetime deal with James, Nike's largest contract was a 10-year, $300 million deal with Oklahoma City Thunder forward Kevin Durant. A source close to the negotiations told ESPN that James' deal dwarfs that number. "LeBron and I have been in love and obsessed with Nike since we were kids," Maverick Carter, James' business partner, said Monday. "Having built a totally innovative global business with them has truly been a dream come true. We are so excited to be taking the business to an entirely new level. For LeBron, he's thrilled to know he's a Nike guy for life."